So, how to do the deed? Lay out your new binding holes on your backcountry skis. If using a mechanical jig you can look down through the drill bushings and check how close to the old holes you are. Once you decide on a position, drill at will if you’re far enough from existing holes. If you’ve got an overlap situation, read on. If using a paper template, punch out the screw locations with a paper punch so you can slide the paper around and see how your new holes relate to existing. If your new holes must overlap the old, then you need some careful fill work. I usually fill the old holes with something like JB Weld or epoxy steel, and poke steel wool in the hole as well. It’s important to fill the holes completely with some sort of hard filler, do so by poking the epoxy and wool in with a small probe such as a tiny drill bit. Use the slower curing epoxy as it’s stronger than the 5-minute versions and makes less heat. Wait 48 hours at room temperature for a full cure before the next step. After the epoxy hardens in the holes (48 hours at room temperature), I smooth it off with a sanding disk in a grinder. Whatever works for smoothing is fine, just avoid anything but cosmetic damage. If the holes don’t overlap but are super close to your new ones, still fill the old holes with epoxy steel and steel wool, otherwise fill the holes with regular 5-minute epoxy, or even use the plastic plugs available from ski shops. Drilling overlapping holes is the tricky part. If the ski doesn’t have a metal layer, start the drilling with a small bit, then step up through successively larger bits to your final size. The idea is to prevent the edge of the existing hole from forcing the bit to the side and only drilling the epoxy out of the old hole. Dealing with a metal layer is tougher. If your drilling begins in the metal, stepping the bit sizes will usually work. If you start in the epoxy fill, do the step-up routine till your bit encounters the metal edge. Then, instead of going to the next size bit, pull the drill most of the way out then hold the spinning bit against the metal edge so it eats sideways a small amount in the direction the hole needs to grow, thus “egging out” the hole. We’re talking a millimeter or less of this, so no big deal. If you’re a craftsman and have a rotary grinder (e.g., Dremel), you can “egg” out the holes using a small rotary cutting bit, which works much better. Take care not to “egg” too far. Keep it tight. If you mess up and end up drilling the epoxy out of an old hole, just re-fill and try again with a little side pressure while drilling. Tap the holes if you’ve got a ski mounting tap, place all binding screws with the same long-cure epoxy you used to fill the existing holes, don’t over torque, let cure for 48 hours, and you’re good to go backcountry skiing! Another method of filling old holes for re-drilling is to epoxy hardwood plugs. This method has its advantages as the plugs can be more structural than the epoxy and steel wool method. Problem is the wood is super sensitive to moisture, so personally I always use the all-epoxy method. If you use hardwood plugs, cover them with epoxy when you do the final binding mount, for 100% defense against water. Yet another technique is to carefully bore holes for inserts such as Quiver Killer. Whatever the case, if you have access to a milling machine or high quality drill press, drilling overlapping holes can be done much more easily by clamping the ski to the machine and boring holes that are forced into perfect position by the rigidity of the machinery. Hey – this is great info. I’ve asked myself (without looking for the answer) this same question because the bindings on my (used) teles have been re-drilled once, and I’d like to get a pair of women-specific bindings (because my feet are small). Thanks for the info! Have a great day… Ski season is on its way! ‘seal’ them and prevent any moisture from getting in the core of the ski and freezing there, which could do some harm. As for the bit sizes, I use standard 4mm bit and it works fine. Sometimes manufacturers tell you which bit to use -Hagan has nice labels on their skis with ski dimensions which also has the preferred drill size on it, which can be as small as 3.5mm for some light (and soft) skis. Also, when you speak of non-metal skis drilling, I think it should be ‘hole edge’, not ‘ski edge’ (‘The idea is to…’), unless I am missing something. Thanks Piotr, I clarified the writing. Im buying a pair of Salomon 1080 Foils (2006) and i have been looking everywhere forf some info on drilling, i want to drill some freestyle bindings on them but should i drill them in the center? i do all freestyle and nothing else, but i have been told if they are centered i t will be impossible to carve and do anything else besides freestyle. I don’t want that. So what should i do?? Hi Dane, I know nothing about that. Perhaps someone else here can chime in. Would you forsee any issues with redrilling a pair of Dynafit Carbon FR 10.0 skis? I would be filling the old holes left from a pair of Dynafit bindings and drilling for a new pair of Naxo’s. Shouldn’t be a problem, fill old holes with epoxy. I am glad that I found your site. I just had a pair of Naxo’s mounted and the shop mounted the toes off center. So happy to hear that I can shift the toes over just a faction. I will not be going back to Coast Mountain Sports (Alberta) again. I would like to mount a pair of Dynafit bindings on a pair of tele skis. I was wondering if there was any diiference in the construction of the ski that would prevent the tele boards from being able to handle the heel piece. Is there any concern about mounting AT bindings on tele skis in general? any advice on using the same set of holes twice? Do you recommend fatter screws or epoxy? Twice shouldn’t be a problem unless previous screws were over tightened. Use a bit of epoxy. Awesome information. I’m mounting my sons freestyle skis. Any info on proper placement. Most of what I hear is to center them. I am currently in the market for som pow skis and I found some I want but they have three mounts already. Is the 4th too much? I’m a heavy agressive skier. I have a set of Solomon skis that I got from a friend. It looks like they have been mounted three to four times. I was considering mounting my bindings on them. I heard rumors that mounting more than three times is dangerous. I’m not a crazy aggresive skier. Should I be concerned about drilling into them one more time? If so what should I take into consideration? Thanks for you assistance and help. Milos, just use epoxy and don’t over tighten. Mike D, sounds like that might be enough holes! Would it be wise to reuse holes that are already there? Merry Christmas. My old Rossi Scratch can take another round with drilling. Using the as an early/late session ski. Rear binding. 16 holes no problem……..! Shifted bindings, drilled wrong, loose binding, bu this time its working. My setup (I live in New Zealand and ski around Wanaka but travel to Canada, Revelstoke area for 2 weeks a year) has been Spirit 4s on feet with 174cm K2 Coomba with Marker Dukes. I had decided this is a bit heavy and after reading wildsnow thought I’d try Dynafits. So I bought a used pair of 174cm K2 Mt Bakers with Dynafit Comforts with binding brakes that looked relativily unused at the end of my NZ season. At least I think they are Comforts, they have about 2.5cm of adjustment and look just like the ones in the wildsnow binding brake install post. The Spirit 4s fit this set up very well, boot midpoint within 2mm of ski mark. I’d appreciate any comments, advice. Hey Lou, great site you got here, I have a question regarding this post on how close can holes be next to each other. I have a pair of Trab Duo Sint Aero skis that I purchased second hand, which were previously mounted with dyanfit speed heel pieces. I am putting Plum race heels on them and due to a very close boot size to the previous owner the front two holes will be close to touching previous holes. Since these will be for racing and have a non DIN heel do I need to worry about pulling these bindings out and/or weakening the ski, or can I just fill with steel wool and epoxy and no big deal? Also do you always recommend using epoxy? Will this render the screws useless if I were to put these bindings on other skis down the road? Thanks ahead of time if you happen to respond to these questions. Brandon, I’d say it’s a question of how aggressively you ski and your size. If you’re of average size and don’t ski crazy, I’d say go for it but do a really good job filling the old holes first. In those situations I use JBweld and a bit of steel wool to fill the old holes, as I figure I want them as strong as possible. Epoxy and glass fibers do pretty much the same thing. After you’ve done a good job filling the old holes, then drill the new ones and use epoxy for the mount. Don’t worry about using epoxy, just briefly heat screws with soldering iron before removal. Machine bits are V shaped and can wander when the V point hits on the edge of two different densities of materials. Twist wood bits in this size diameter, often have a centre point and cutting spurs on the outside diameter of the bit. The centre spur fixes the start point and the cutting spurs make for a clean downward cut without bit wander. Wouldn’t these wood bits make for a cleaner, straighter hole? I have a pair of Atomic TM:Xs (the blue ones) that I want to mount with a pair of Dynafits. The skis already have a number (14) of holes in the toe area from moving the previous bindings (Hammerheads) around to play with different mount locations. I can mount the Dynafits pretty close to “center” with about 7mm center to center between the new and old holes. Should I be worried about so many holes in the skis or the proximity of the new holes to the old? I have been told that 1cm is the minimum distance that should be kept between holes, but I know you propound otherwise in your original response. I am ~155lbs and I ski aggressively but, I would say, lightly. I haven’t broken a ski since I was in high school and snapped a Rossi 4S right behind the binding heel. I have never torn a binding out of a ski, tele or alpine. Also, I have a pair of Volkl Gotamas that I remounted, from HH to Dynafit, keeping 1cm center to center between holes. This put me 2cm forward of “center” on the ski. In your original response you recommend moving backward for recreational and backcountry skiing. It feels like I am a bit farther forward on the skis than I would like. Do you think it is worth another remount to get back closer to “center”? By “center” I mean boot lined up with the boot sole center mark on the skis. Dynafits? Seriously? This David Perez? Yep, that’s me, and those are the skis in question. I am making the switch. I can hardly believe it myself, but my knees are thanking me already. Jeez, I almost feel bad (grin). I am looking to buy a pair of Volkl Gotamas from a buddy and current bindings are set for a 9/9.5 boot. I am a 11.5/12 boot. Its a Marker 14.0 binding. Downhill style. Will I have to re-mount bindings? Is a 3rd time mount okay ? I’m an aggressive skier, but the waist of the ski is 105 if that helps. Lou- I just picked up a pair of rossignal s7’s (2011). I weigh about 195 lbs… and am a telemark skier… although I don’t know if I would consider myself aggressive or not… Like to ski backcountry shots…. up to 45 degrees… although I’m not a real fast skier…. Got a good deal on these skis.. am I setting myself up for a broken ski / miserable day? I have tried to fill the holes in my old Atomic TM:Xs with epoxy, but I keep getting air bubbles in the epoxy. I have read that this can happen with foam core skis. Does anybody have any advice for how to prevent this from happening? Also, the holes for my new bindings are going to have to overlap the existing holes. I know that Lou’s original post suggests that this is okay to do, but I have to ask, is it really okay? And would I be better off using something like a Quiver Killer insert to create, in effect, a larger screw with more surface area? I put three-pins on my Epochs and ended up overlapping holes. I use plastic boots and get air and crash hard on that setup. No issues so far, and I’m placing way more force on those three screws than any AT binding. I filled the holes with JB Weld and matchsticks. Fill the holes with epoxy, and then carefully heat them up with heat gun. Epoxy viscosity is getting lower and the air bubbles are coming out – epoxy is going in. You need to repeat this twice or more. Then apply an aluminum tape above the holes and turn skis upside down over night. Regarding overlap, with most skis moving binding forward or back a few millimeters will make virtually no difference in how they ski, so that’s frequently the solution…. Heating the epoxy when it’s curing is a really bad idea. The temperature the epoxy is meant to cure at is the only temperature you should have, anything else is gonna mess with the epoxy strength. The air bubbles is the least of your worries. What you want is glass fiber. you really want more than 50% fiber weight, 70-80% fiber weight is MUCH stronger, this means you need wipe off ALL excess epoxy from the little pieces, you want them as dry as possible. PS. I did a quite spectacular motorbike engine water pump repair with commercially available two component ‘chemical metal’. Water pump was cracked to the hundreds of pieces of magnesium. I glued them together with that ‘glue’ and let is cure in the oven. (according to instructions) after 10 years, this pump is still tight and working. Moral of the strory is that those modern 2-part bonding glues are really good. Just pick the right one. always follow the exact instructions regarding the very product you are using. Thinking of buying some Rossi S7W 178 that have already been mounted twice once with Salomon Z12ti and then with Marker Tour. I plan on mounting them wth BD 01….any thoughts on this set-up? I will not purchase them if it is not going to work. Thanks for the heads up Lou! Bob, if the holes are not too close together and not too many, regular old clear epoxy works fine…. Thanks for the reply. I really love what you’ve got going on here. But for these old skis I will be mounting some alpine bindings, since the skis are of the “freerando” type and still usable. The mounting pattern of the new alpine bindings is 5-6 mm exactly behind the naxo ones in the toe piece. Is 5 mm enough space for mounting new bindings without issues? Usually people say that thing of “at least 1 cm” but I don’t really know. I was thinking of filling the old holes either with plastic plugs or with a combo of steel wool-epoxy. I think I know the answer based on what I’ve read here so far, but any comments you have would be appreciated. I’m looking at a pair of 2008/09 BD verdicts that have been mounted twice already with tele bindings (BD 01s and NTN). Provided I follow the advice with respect to filling and avoiding overlap, would it be a safe bet to mount fritschi AT bindings next? I’m 5’10”, 175 and an aspiring intermediate skier that won’t ever get super aggressive. Thanks so much for the information! I don’t think this has been covered yet so I will ask — what if I am putting the exact same binding back on the exact same ski for the exact same skier and boot size? I stripped bindings off a pair of skis last year, skied the new pair of skis to their death, and now want to put the bindings right back on the skis I took them off of to begin with. Do I: (1) fill and drill in the same spots? (2) fill and try to slightly alter where the building lays on the ski? (3) simply screw back into the existing holes? I’m wondering what your thoughts are on a specific technique to fill holes. I saw someone the other day who would fill the holes partway with regular old 5 minute epoxy (not the steel variety), and then place a golf tee inside the hole. Once it hardened, the top of the tee would be cut off and then ground flat with a dremel tool. It seems to me that this would be much stronger than regular old plastic plugs, but i’m wondering how you think it would compare to your recommended steel epoxy/ steel wool? Hi Michael, that would work, it essentially just fills the hole with wood. The advantage is is fills the hole without any voids. Doing it just with epoxy, it’s sometimes difficult to push epoxy into the hole without any air pockets. You can do it with match sticks as well, though the golf tee is harder wood (?). Either way, the top of the wood needs to be sealed from water damage after it’s smoothed off, that is unless it’s re-drilled for to be used again for mounting bindings. I’m still doing this stuff quite a bit. One problem I’ve found with epoxy is that unless it’s mixed correctly and allowed to really harden, it works fine for filling holes but is less than ideal if it needs to be re-drilled and inserted with another screw as softer epoxy may not be strong enough. In terms of “stronger,” are you concerned about the strength of the skis from breaking, or strength for re-inserting screws? Most skis these days are super strong. – How often can you screw bindingscrews in the same allready existing holes? For some reason I had to take the screws out from my tlt vertical backpiece. Than screwed them in again, but forgot the glew. screwed them out and in again with glue. Do I have to worry? – In one of my k2 waybacks a shop had to screw new holes for a binding. the old ones were filled by just hammering in plastic pegs (no epoxy). Is this sealed enough? Erik, you can use the same holes quite a few times but they do deteriorate a bit each time. If you use epoxy each time, and heat the screws when removing, you can do it dozens of times. Key it to not over-tighten but to still tighten enough. Requires a “feel” for appropriate tightness. As for the plastic plugs, they seal the holes just fine, but are not liked here at WildSnow HQ because when drilled out the remaining plastic in the hole may not bond to epoxy. We usually fill our holes with epoxy or urethane glue if there is a chance we’ll be drilling them out again. For temporary sealing, I just put duct tape over them. Once in a while we use the plugs. Thank you for your advice and the very quick answer. Not the first time you or some poster here helped me out.. great!! Hi Lou, Not sure if I’m over thinking this or not, but on my skis (moment exit world, no metal top sheet) it says to use 3.9mm x 9mm holes. My problem – I can’t find 3.9mm drill bits on any of the sources I would expect (Tognar, slidewright, svst). Everyone does a 3.5 and a 4.1. Am I looking in the wrong places or does it really matter? What would you suggest? Thanks a lot. Drew, sorry, for some unknown reason you comment got spam moderated. Am trying to fine tune that. And yes, just use 3.5 with a few turns of the tap, with epoxy and care with torque, you’ll be fine.Or use the 4.1 without the tap and be careful tightening. I suspect they spec 3.9 to prevent too much stress on the topskin, or perhaps it’s a typo. i picked up a pair of ski trab stevio xl lights 185cm (125, 90, 112). The bases have been skied once and are essentially mint. They are mounted with some dynafit st-10s. I am a noob skier and never intend on skiing aggressively. I’m 6’1 180. I didnt realize why they were so cheap until i saw all the holes, there are 6 holes (3 per side) to the rear of the binding. The owner said they were on the 4th mount. Besides the holes, they appear to be fine, they appeared to be plugged with wood and some sort of epoxy. Should I be safe? Seems like people have done alot more. I just want to ask someone who I know knows their stuff. Thanks for the blog and your time! So are we concerned about a ski breaking or just screws pulling out? For sure Lou. For the record, I’ve re-mounted a few skis with holes only 2 or 3mm apart with no problem. The BD test is a “best case” thing, not a real-world scenario. But judging by their results having significantly lower strength with “close” holes, I’d probably use more epoxy with holes 2 mm apart than I would with them 7mm spread. Something I’ve done in the past when drilling a hole that partially encroaches on an existing hole is to drill a hole of the desired final size in a1/4 steel plate, center it over the spot where the new hole is going to be and clamping in place. Basically it just keeps the bit from wandering into the old hole as you drill. Everybody who messes around fixing things should have a small kit of REAL epoxy, not the five minute stuff you get at the hardware store. Buy a mini-pump kit with it and it will still be usable for years. WEST system or MAS brand both are excellent. Any marine supply store— Fisheries Supply in Seattle, West Marine etc carries it. You can do all kind of repairs and fabrication with it, up to building a new rudder bearing for a 35′ sailboat. For filling binding holes you’ll need a quart of Cabo-sil silica as a filler and a few throwaway syringes. Mix the silica and catalyzed epoxy to achieve a viscosity about like maple syrup and inject it into the very bottom of the hole. Wait a few minutes, pop any air bubbles, and slightly overfill. At least as strong a filler as any attempt to use glass fibers or rust prone steel wool. I like to use the same procedure on a new mount as well. By filling the hole with liquid epoxy the epoxy is squeezed out into the surrounding wood core as you tighten the screw, substantially increasing the holding power of the installation. Never had a problem with removal, but if you do, heat the screw with a soldering iron and it will release. The problem with mini pumps is you will waste a lot of epoxy if all you’re doing is filling a few tiny holes. Better to use a scale for this sort of job, in my opinion. For small jobs its a trade off between getting the proper mix ratio vs saving a bit of epoxy. I prefer to err on the side of having the strongest bond strength.. If you must hand measure, choose a brand with a 2/1 ratio. … or use an accurate small batch scale, like a West System 320. So I recently pulled some bindings off some used skis (Blizzard Kabookies – only a few years old). I would like to re-use the holes. They have a metal topsheet and the threads in the metal topsheet look good. I can thread a screw in without issues. But the wood core below the metal topsheet doesn’t have great threads. The threads in the wood are thin at best, pretty non-existant. OK to re-use as long as the threads in the metal topsheet are OK? Of course I’d fill the holes with slow set epoxy when mounting. I am mounting Dynafits. Competent skier, but not hucking. I ski fast in good snow but dial it back in variable conditions. Note to all Wildsnow readers building space ships in their garages: epoxies can have slightly different mix ratios depending on whether you’re measuring by volume or by weight, so make sure you are using the right ratio for whatever method you’re using (or just do as RDE advises and use a properly functioning, primed and calibrated pump system). But you rocket scientists already knew that. Seriously, though, RDE is correct that care should be taken to get the resin/hardener ratio right, and be sure to mix thoroughly. Minor detail, but pretty much every non-metal ski calls for 3.5mm or 3.6mm diameter bits, I’ve never seen a 3.9mm. Typo in the original write-up Lou? And Armada calls for their special tapered 3.5/4.1mm step bit, should anyone be mounting Armada skis. Seems to help with reducing the topsheet hemorrhaging/volcano’ing. Just some added info for anyone attempting drilling for their first time. A tapered bit, for metal skis with a softer core, is really smart; why hasn’t that become a standard? In the soft part of the core, essentially every ski wants a small-diameter drill bit. No re-use of holes, and the Radicals were mounted with inserts so the holes are huge. I’ll see how my brother-in law makes out with the Speed Turns this winter. Small holes were plugged with epoxy and plastic inserts; large insert holes just coated with epoxy to seal them. Hard to believe it’s now 9 years since that post. I still wish I had those Tua’s! Glad this post has proved useful and helpful to Wildsnow readers. I’m still resuing skis and filling holes. Have a good winter and keep up the great work! Hi Lou. I’m posting to this thread because a have a do it yourself question. I want to remove the lower buckle from some old Scarpa boots. The buckles are pressed/riveted into the shells. There is no way to remove them with screws or threads, as far as I can see. I thought about drilling them out, starting with a small bit, and working up in size, and then finishing the hole with a step drill, but I am afraid that the whole press/rivet will start to rotate in the shell–I have no way to hold it in place. I also thought of using a hacksaw to remove the buckle, but I will almost certainly tear up the shell somewhat. What’s the best way to do this? Somehow…I think you have removed some ski buckles in your time. Thanks. I saw your blog post about shortening Silvretta Pure bindings. I have a pair of size N Silvretta 404 bindings that I would like to shorten to fit my girlfriend’s smaller foot. I’ve been scouring the web, ebay, etc. for the smaller size K’s or XS’s and there just aren’t any around. I am considering trying to grind two additional slots in each of the bindings’ tubular frames to allow the rear foot plate to slide further forward. But I’m wondering if the front of the binding can be disassembled to reveal ends of the frame which can be trimmed in length; or if what’s under the front is actually a continuous “u-shaped” frame which comprises the front axle, and which then cannot be cut–? Any help, including perhaps another method of shortening these things would be greatly appreciated. Or maybe someone knows of some size K’s that are available? Question: are the drilled holes in the middle big problem, ? how much is the ski weakened, i have 85kg, moderate skier thanks for answer, + thanks for your work, wildsnow is my favourite ski site. 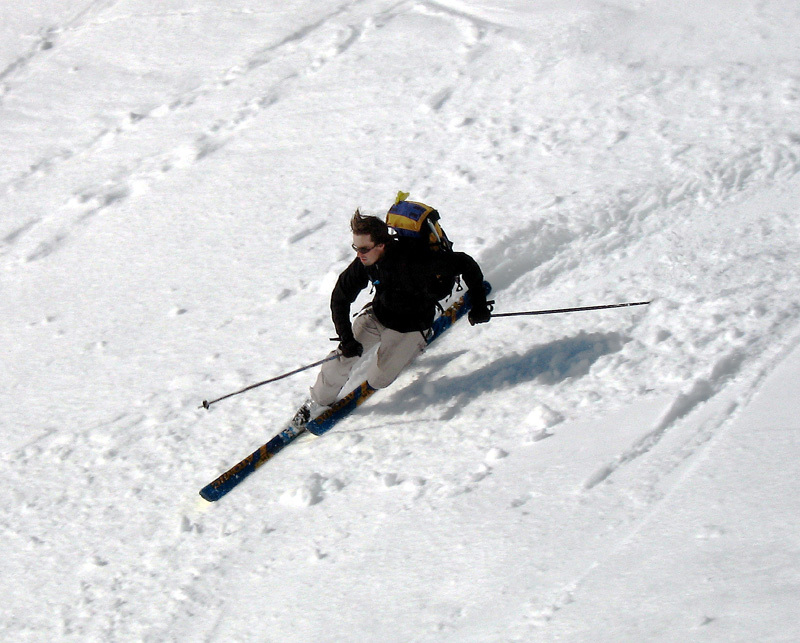 If the ski is going to break somewhere, I doubt it would be the stiffest part – the middle. Viktor, Matus is pretty much correct, though some fragile skis do tend to break at the binding mount area. Regarding your Dynastar ski Matus is exactly right, no worries, you don’t even need to fill the holes so long as you cover them with waterproof tape or a sticker, though filling them would probably be a good idea. BTW, a mistake like that on a new pair of customer owned skis should in my opinion mean a new pair of skis for you, and the shop takes the pair with the mistake and sells them. Because the shop can get skis for wholesale, and they can sell the miss-drilled skis for price near wholesale or use them in their demo fleet, they don’t actually lose much if any money and make a much happier customer who will return. Sending you out on the mistake skis is pretty lame IMHO though you were very kind to let them do that, Christmas Spirit and all. I recently bought a pair of Voile V8’s that had been miss drilled (Dynafit TLT pattern) by a shop. I have a set of G3 ions I want to mount but the first two screws in the toe piece have at least 50% or more overlap with the old holes. All other screws have a good amount of clearance and were filled with plastic plugs. Do you think I will be able to successfully remount these skis with the epoxy/steel wool method? Hello Cor, much of this depends on your style of skiing, weight, length of ski, etc. Myself, with my subdued style, I’d just use the epoxy method and go with the overlap, but I’d agree that is risky. I’d recommend that larger skiers or those who are aggressive would either move the binding forward or back, or use a different binding that set the screw holes farther away from the originals. Also, are the existing holes enlarged by previous screw placement, or are they just the pin holes left by a drill bit? If you choose to use the epoxy and steel wool method, use the same epoxy to do you final screw placement as you do for the fill, and test the final choice in epoxy by saving a blotter with the fill epoxy and hardening some of the additional epoxy on top of it. I had a situation where my final screw placement epoxy softened the original. I’d recommend regular JBweld for both stages, and let the hole fill epoxy cure for 48 hours before the new screws are drilled and placed. BEST, use inserts such as Quiver Killer for at least the overlapping holes. I trust you got a good deal on the skis! The holes look like they have threads cut already. I bought them from an rei garage sale for super cheap. I did manage to speak with the tech that worked on the skis. He said their jig slipped out of alignment while drilling. The skis were never used and hole not glued. If I mount boot center on the recommended line, the front two screws overlap quite a bit while the back two are plenty far from any holes. If I mount the toe piece back .5-.75cm back I wind up with about 2mm clearance on all four screws. I’m unsure which scenario will get the best results. Do you know What effect moving the mount back that far will have on performance? Also, I’m 190lbs and ski pretty aggressively. Anyone ever done a helicoil on an insert (Binding Freedom in this case)? Both the two rear-most holes are 1mm too wide – the template had them at 38mm, where they should be at 36mm. Bindings won’t fit on as a result. What’s my best bet? All the other inserts are spot on. Do I fill with epoxy and go again (which sounds dubious), or do I go with a helicoil – where do you even get one of those for Binding Freedom!? Hi Dan and everyone, first, a few reminders about important procedures that could have prevented Dan’s or other’s trouble. First, when using paper template always compare to actual binding by setting binding on the template as well as doing some measuring. By the same token, most paper templates have a print scale verification, be sure to check that as well. Next, once you are certain you’ve got the hole layout correct, always mount the binding first before installing inserts. Then remove binding, and do the inserts. If Dan had mounted the binding before doing the inserts he would have discovered his rearmost holes were 2 mm off (1 mm each), which is easy to correct with a normal binding mount situation, especially with the rear holes in the rear binding unit as they don’t undergo near as much stress as the front ones. As for correcting this with helicoils combined with inserts, no way, as that would require boring huge holes in your skis. Instead, I would simply relocate the heel unit forward or back a couple of centimeters so you have room for an entirely new set of holes with inserts. Locate the binding in such a that it of course will still fit your boot length after adjustment, as well as perhaps accommodating another boot you might use. And this time, actually mount the binding heel on the new holes with normal binding screws, verify, remove, and after that install your inserts. I always wonder why folks don’t just use the binding for the template ? I use both. Seems like bindings are often a little bit out of whack geometrically. I use a drill bit the same size as the screw hole in the binding to make centered marks on the top sheet. Then use correct size bit to drill holes on drill press. Yeah, definitely a lesson learned there! Got a bit over-confident, but won’t make that mistake again. It was due to the heel piece not allowing a clear view of two holes, otherwise I would have detected it much earlier. Drilling with normal screws would have done the same. I’ve heard a helicoil is possible – I even know the right size to get. However, I do agree with you about size of holes – it will get a bit ridiculous with such massive holes with an insert holding an insert holding a screw – seems to be asking for trouble. I could only mount at +3 to avoid other holes, and I don’t see that working. I’ve even tried to see if a Radical 2.0 heel could fit on – again, existing holes make that tricky. 1. Go with the helicoil…and potentially compromise the integrity of a perfectly good ski. 2. Use this ski only with race bindings (and probably throwing an old radical toe piece on – no need for rotating toe). Given option 2 is the most likely, should I just leave in all the other inserts I’ll never use, or can I take them out and dow/expoxy the other holes? Thanks for all your advice thus far! You sound like you’re doing serious skiing, so I’m reluctant to touch this, but, if you can find someone who knows what they’re doing, I’d say fill and drill. Here is a question regarding epoxy as I recently had problems with curing 1-hour epoxy. What factors in the process are most critical? Is it application temperature? Is it ratio of hardener to resin that is more important? Most batches cure eventually, but I have recently had one that is still unhardened after about a week (I saved the mixing cup with the hardener/ resin mix). Any thoughts are welcome. Hi Mark, in my experience that often happens when the mix ratio got messed up, or the epoxy got contaminated, or it wasn’t mixed thoroughly. I suppose a batch of epoxy could also be defective. You can usually fix by removing the screws and re-do with plenty of epoxy that’s known to harden, use same brand. Perhaps fill the holes once, let cure, re-drill and epoxy again, perhaps test the process in one hole with one screw to determine the best approach. – I am DIY – challenged and would prefer to have a shop mount the bindings. Does anyone know about a ski shop that is willing to drill overlapping / very close mounting holes? We live in Boulder and the closest shop insists on a minimal distance between holes, 1/2 inch if I recall correctly, which would place the new binding about 2 inch off recommended boot sole center. I recently purchased a brand new pair of Liberty Origin 106’s. I specifically asked them to mount the bindings 2cm forward of core center/recommended mount. I mentioned it multiple times to be sure it was noted. upon picking them up I noticed they had not done what I asked and instead mounted them at the recommended center. Is it fine to have them remount to 2cm forward like I asked no problem? or should i insist they mount where I asked on a new pairto avoid drilling a second time since it was their fault.